Are you also one of these people for whom a holiday is not complete without a native wildlife encounter? We are too! Are you also worried that you might step into a tourist trap and pay money for an experience where animals are being exploited and taken out of their natural habitat only to please tourists to make money? Same here! At Fleewinter, we are passionate about NOT being part of this big tourist game, we inspect all wildlife experiences we offer to our clients and if we feel that animals are not treated in the right way, we won’t recommend or sell these experiences. As, luckily, we are asked this question more often these days, we found it was about time for a blog post about ethically sound wildlife encounters in Asia. Enjoy (and start planning your next trip)! Sri Lanka is a wonderful destination for anyone looking for that unique wildlife experience. There are over 22 national parks with Yala and Uda Walawe topping the list for many intrepid travellers. All the parks are teaming with a variety of wildlife and bird species. Yala National Park is the only park in the world where you can observe the Sri Lankan Leopard and Uda Walawe is home to the largest number of elephants on the island. We place great emphasis on ensuring all our wildlife experiences are ethical and in Steffi’s (our Sri Lanka country specialist) opinion there is nothing better than going for a game drive to observe mammals, reptiles and bird species in their natural environment where they can roam for miles and enjoy the freedom that they deserve. The Elephant Transit Home, on the borders of Uda Walawe National Park was established by the Department of Wildlife Conservation with the primary objective of rehabilitating orphaned elephant calves for ultimate release back into the wild. The orphans are free to roam the national park and come in for feeding of their own accord three times a day. It is well worth a visit to watch the orphans feed without disturbing them. We recommend a visit to the ETH combined with a safari (or two) in the park itself. You may even glimpse one of the orphans roaming free in the park. Our favourite way to experience these safaris is to stay in the bush in luxury tents with Big Game Camps. Sri Lanka can also offer some fantastic marine wildlife experiences. The combined Mirissa (December to April) and Trincomalee (March to August) seasons for watching Blue Whale gives Sri Lanka the longest and best Blue Whale watching season in the world. 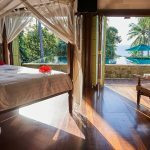 Why not stay at one of Sri Lanka’s newest luxury resorts, Cape Weligama or the beautiful Frangipani Tree, Unawatuna? Trincomalee, on the east coast features some beautiful resorts such as Jungle Beach or Maalu Maalu (further souther in Passikudah). Borneo is paradise for wildlife lovers. There are many areas to see strangely-shaped proboscis monkeys, macaques, langurs, orangutans, and pygmy elephants in the wild. 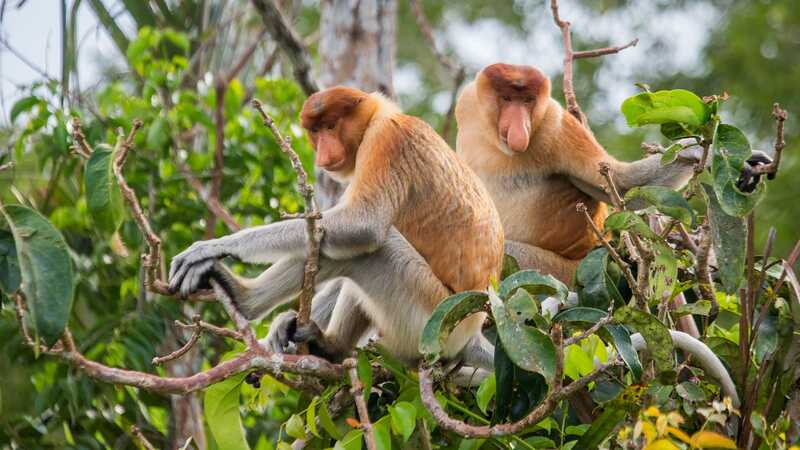 In places like Sukau, you’re nearly guaranteed to spot proboscis monkeys during your boat ride along the Kinabatangan River to reach your lodge. We love the National Geographic recognized Sukau Rainforest Lodge with its team of excellent guides who offer engaging talks about apes, wildlife conservation efforts, and more. With a bit of luck, you can see orangutans, pygmy elephants, and a variety of other animals in the area. As these are wild animals, there’s never a guarantee you’ll see them but it’s hard to get more ethical than this when it comes to wildlife viewing! For a more in-depth encounter, you’ll need to visit one of the rehabilitation or conservation centres. Visits to the Sepilok and Semenggoh centres are educational and worthwhile but we think the ultimate in ethical wildlife encounters in Borneo is at Matang Wildlife Centre. Matang is a rescue centre for all of Borneo’s protected animals. The team’s aim is to rehabilitate and release every animal that comes into its care. Baby orangutans are damn cute but there are so many other animals here that have been saved from the illegal pet trade, orphaned, or are otherwise unable to survive in the wild. As a result, you may see animals at Matang that most visitors to Borneo never encounter such as clouded leopards and slow loris, both extremely hard to spot in the wild. There is a strict no-contact policy at Matang for two reasons. First, human contact can spread disease these animals aren’t equipped to handle. Second, animals in need of rehabilitation can suffer setbacks and challenges when exposed to too many human handlers and caregivers. Visitors to Matang instead have the unique opportunity to speak directly with the staff who provide care to the animals, to help with projects that assist the staff, and to learn the details of how a rehabilitation centre functions. You can even help build enrichment projects for the animals to help with rehabilitation efforts. A behind-the-scenes look into this important work is an experience like none other. Admittedly, the accommodation isn’t exactly luxurious but the air conditioning works, there’s a hot shower, and you’ll leave with a wealth of knowledge about Borneo’s wildlife. Ranthambhore National Park, located in the colourful state of Rajasthan in north India, was originally the former hunting ground for the Maharajas of Jaipur. These days, however, it is known as one of the best places to view majestic Tigers in the wild. As well as enjoying incredible sightings of wild tiger during morning and late afternoon game drives, visitors can also expect to see deer, monkeys and colourful birdlife. If you have always wanted to see tigers in the wild, take a look at our Golden Triangle and Tigers itinerary. Local wildlife in its natural habitat may also be observed whilst glamping at the Khem Villas, the Sher Bagh or luxuriating at the Oberoi Vanyavilas at Ranthambhore National Park. For the ultimate wildlife experience in India, email Jessie and Jenna at india@fleewinter.com. When it comes to wildlife, the Philippines is known for two animals: whale sharks and tarsiers. We don’t recommend snorkeling with the whale sharks at Oslob where the gentle giants are fed, disrupting their migratory lifestyle and damaging their health with poor nutrition. We do, however, know a great option for seeing tarsiers. These highly territorial animals need a huge amount of space and if kept in captivity, have been known to end their own lives. At the Tarsier Sanctuary in Bohol, these little jumpers with big eyes are free to come and go as they please. Guides walk the sanctuary in the morning looking for sleeping tarsiers to point out to visitors. The nocturnal animals may wake when you approach although hopefully they’ll keep sleeping. Either way, you can get close enough for a photo with one behind you but you cannot touch. The guides are quite knowledgeable and a walk through the sanctuary is an enlightening and fulfilling experience that can be enjoyed by visitors of all ages. 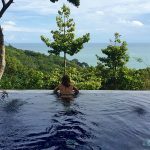 It’s an easy excursion from some of our favorite boutique resorts in the Philippines: Amarela, Tarsier Botanika, and the family favorite Amorita. If you want to get close to Tarsiers, then don’t hesitate to drop Marbree an email at marbree@fleewinter.com. There are a few really good Elephant Camps in Northern Thailand, such as the Elephant Nature Park in Chiang Mai, and the Elephant Sanctuary at the luxurious Anantara Golden Triangle. We have tested the Mahout experience at Anantara and have spoken to their biologist about riding on the gentle giants at length. The Elephants living here come with their mahouts and their families. They are free to come and live in the camp and are also free to leave any time. They have an endless space to roam around and are treated with a lot of respect and love. If you are looking for an adventure in the southern part of Thailand, where you can feed Elephants in the jungle, surrounded by majestic limestone formations, glamp on an emerald green lake and wake up to the sound of gibbons, keep reading, as we have recently tested the fantastic Elephant Hills camps at Khao Sok National Park. Elephant Hills are Thailand’s first Luxury Tented Jungle Camps, combining the camp idea of African national parks with the Thai tropical forest environment, offering 2-4 day nature soft adventure tours in and around the stunningly beautiful Khao Sok area. The Elephant Camp comprises 35 luxurious, tailor-made tents and has successfully been operated since over 10 years. The floating Rainforest Camp, one of the world’s only luxury floating tented camps, was opened in 2011 and is situated on the emerald green waters of Cheow Larn Lake. Both camps are situated in the Khao Sok National Park in Southern Thailand, approximately two hours apart from each other, close to popular beach destinations like Phuket, Khao Lak, Krabi and Koh Samui. Marbree and Eva were lucky enough to participate in the 3 day Jungle Lake Safari, which included one night in both camps. The experience started with feeding and bathing the animals in the camp’s Elephant Sanctuary, an absolutely heart warming experience. There were too many adventures to describe them all in this blog post (as surely there is enough to fill one entire blog post), but the highlight was the night at the Rainforest Camp on Cheow Larn Lake. We jumped into the warm emerald green water from our balcony and spotted monkeys, eagles and gibbons in their natural habitat while kayaking on the lake. We also trekked through the jungle to a hidden cave where we walked past a white snake that had just eaten a bat (nothing for those with a high startle response). If you want to find out more about Elephant Hills, check out our Hill Tribes and Elephants itinerary, or email Eva at eva@fleewinter.com. Although Laos is sometimes called the Land of a Million Elephants, we think the most ethical wildlife encounter in Laos is the Gibbon Experience. On a three-day visit, you’ll trek into Nam Kan National Park, sleep in an open air treehouse, zipline through the jungle, and wake up to the sound of gibbons singing. If you’re lucky, you’ll see Western Black Crested Gibbons swinging and playing in the trees. The experience is like nothing else we’ve encountered and the member of our team who went counts it as one of the highlights of her travels. It’s not for those with a fear of heights or unwilling to be active as there are hours of walking and ziplining each day as you explore the Bokeo Forest searching for gibbons. Started with foreign involvement, the Gibbon Experience is now staffed entirely by Lao citizens and a few foreign volunteers. Original guides were former poachers, enticed to make more money guiding tourists than hunting endangered animals. Today, many of the guides are family members and tribesmen of those original guides. Significant efforts are made to preserve the forest and create a sustainable future for the people, animals, and land. In a fairly remote location, you’ll need to reach the area from Luang Prabang or Chiang Rai (where you can feed and bathe Elephants at the Anantara Golden Triangle, mentioned before). If this sounds like the ideal holiday experience to you, please get in touch with our Laos Specialist, Delia, at delia@fleewinter.com. We love the Green Hill Valley Elephant Conservation Project in the jungles of Kalaw, established by a family with a history of working with elephants in the Myanmar Timber Enterprise. Their focus is on providing care for elephants that are no longer fit to work. The experience the camp offers includes feeding the Elephants and bathing with them in a small river. Another reason for starting the camp was the desire to educate and share information with both local residents and foreign visitors. In 2012, the family managed to hire several disabled elephants from the MTE and a five-year-old male was added in July 2012. Thanks to the income provided by visitors, elephants can enjoy their full retirement and receive the veterinary care they require. Visitors also get the chance to plant a teak tree, as a part of the family’s efforts to replant the rainforest. We can’t wait to visit Kalaw again and see how tall our tree has grown in the meantime. If this is something you would like to experience, check out our Meander through Myanmar itinerary or get in touch with Delia at delia@fleewinter.com.